BMW was in a difficult situation in the late 1950s. It still felt the effects of the second World War, such as the loss of the car factory in Eisenach and the bomb damage to the Munich factory. Motorcycles weren’t selling as well as they used to, money was lost on the large 501/502 model, and the Isetta wasn’t sufficient to keep BMW alive. While the 700 was a step in the right direction, what BMW really needed was a mid-sized car. Unfortunately, it was lacking the money to pay for the development. 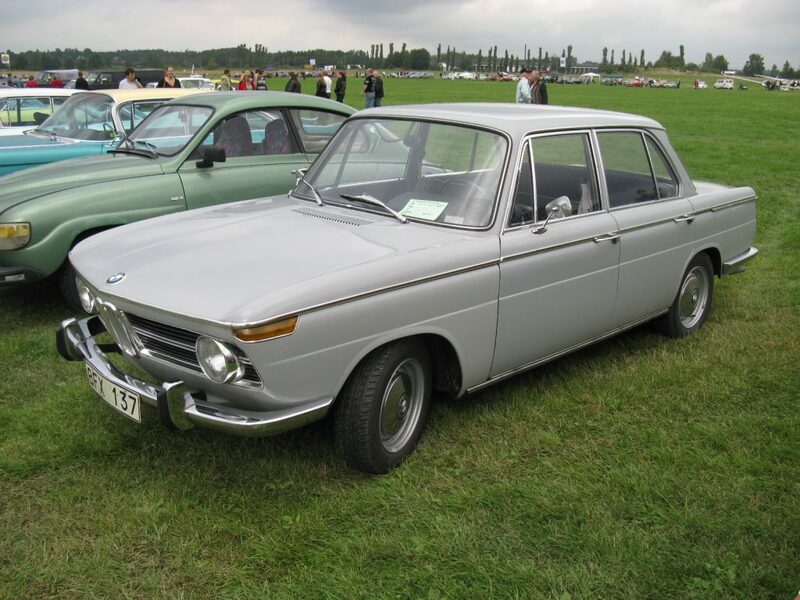 In 1959, BMW came close to being acquired by competitor Daimler-Benz. Salvation came when the Quandt family stepped in, acquired a large part of the BMW shares and thus provided the money for the development of a new model, the Neue Klasse. The Neue Klasse would become typical for BMW as a car manufacturer: front engined, rear wheel drive, leaning more towards performance than comfort (as Daimler-Benz did). The first model was the 1500, presented in 1961 and available for sale in 1962. The newly developed M10 four-cylinder engine would stay in production in various forms for 25 years and even form the base for the 1,500hp turbo Formula 1 engine. In the 1500, it developed 80 hp – which may not sound like much, but when you take into account that the most powerful VW Beetle at the time only had 34 hp while being not much lighter, and the Mercedes W110 190 had the same power but was more than 200kg heavier, it becomes obvious that the BMW Neue Klasse aimed at a more sporty clientele. In 1963, the 1800 model was added, with a 90 hp 1.8l engine. The 1800 TI with 110 hp aimed at use in racing, with the ultimate racing version being the 1800 TI/SA introduced in 1965, a car that would go on to win many important races. The 1500 was replaced by the 1600 in 1964. A coupe, the 2000 C/CA/CS, was announced in 1965. Its styling was a bit quirky, with new rectangular headlights. Rectangular headlights, luckily of a more pleasing style, were also used on the 2000 sedan that was introduced in 1966, with a 100hp 2.0l engine. The 2000 TI/tilux had 120 hp, and was replaced by the fuel-injected 130 hp 2000 tii in 1969. The Neue Klasse not only saved BMW, it also became the root of the BMW family tree. It was replaced by the first 5-series (E12) in 1972. The two-door derivative 02 became the ancestor of the 3-series, the coupe of the E9 and thus the 6-series, and the closely related E3 the ancestor of the 7-series. The 1500 did 0-100 kph in 16 seconds with a top speed of 150 kph. The TIs got closer to 180 kph, and while I could not find acceleration figures, 11 to 12 seconds for the 0-100 sprint sound reasonable. This may not sound impressive, but remember that this was 50 years ago, where a standard Beetle would struggle to reach 100 kph. The most influential car in BMW’s history. Decent performance for a car of its age. Compact and lightweight, likeable styling. Somewhat underrated and thus still affordable. Rust. Less popular than the two-door 02. Limited parts availability. The 1800, which is more more affordable than the sought-after TI models and probably cheaper than a comparable 02, too. It also has, unlike the 2000, the prettier round headlights.